Sonko: Political-philanthropist of the year and Nairobi Governor? As the year ends, so is the politics of 2013. It is the year which saw kenya change the occupants of certain key offices including the president of the republic. Also, the new constitution ushered in various new elective posts, key among which was the re-establishment of the Senate. Initially, it appeared that the senate would be more lucrative and with more political clout than the national assembly. Great parliamentary debaters left the national assembly for the senate. But for the few months it has been in re-existence, the senate, thanks to the continued onslaught from members of parliament, has becoming less and less ‘politically’ significant. There are rumours that some of the senators are considering returning to the national assembly or heading to the more ‘independent’ gubernatorial politics. None has been more keen to make that change than Nairobi Senator Mike Mbuvi Sonko. The man who brought ‘swag’ and ‘bling’ in Kenyan politics is increasingly cutting a larger-than-life figure for himself, and which, according to close observers, is not in vain. No animal under the face of the earth is more calculating than a politician. To these highly intelligent members of the primate family, an election is ever a day a way. As soon as one is won, preparations for the next begin almost immediately. How is Sonko doing it? Senator Mike Sonko has consistently maintained a heavy presence among his key electorates. In Nairobi, he is the quintessential philanthropist. He is some sort of Jean Valjean in Hugo Chavez’ Les Miserables. He is everywhere, especially where tragedy has gnashed humanity. Like Valjean, an ex-convict who finds solace in substituting law with grace, Sonko has remained to the Nairobian poor what mother Teresa is said to have been to the destitutes of Calcutta. In his own words, Sonko sums up his rendezvous with the poor thus, “I learned to give not because I have many (sic), not because I want to show off, not because I want publicity but because I once used to have nothing and I know exactly how it feels to have nothing. Serving the people is serving the Lord”. But how can a man believed to be part of Kenya’s “white powder” mayhem be so easily ‘cool’ at heart? Sonko has pacified the wretched of Nairobi with not only his money but his presence. And he has done it throughout the year. You see, during festivities like x-mas and New Year; there is this ritual where our leading politicians suddenly realise they live among some of the hungry and sick people on earth. Â As such; a lot of compassion is on sale. They straddle the length, and breadth of hospitals, children care homes, orphanages, hospices and when they want to be more dramatic, make impromptu visitation to some old, sick, isolated couple living helplessly in some forgotten corner of the country. But for Sonko, the Nairobi Senator, there is that marked difference; that enduring consistency with which he shows ‘compassion’ to the poor of Nairobi. From the long queues whenever it is rumoured he is in his office. The night calls to constant slum fires. The morning flights to scenes of mass sufferings like the recent Kibera train or the Ummoiner crash. The Westgate terror where the senator is seen in military vest snatching a baby from a fleeing woman. Some of these are purely opportunistic moves, but who cares? Those in Nairobi have probably seen the big billboards with Sonko road safety messages. On his Face book wall is filled with the extremes of the two worlds – opulence and penury ; power and hopelessness, politics and philanthropy. 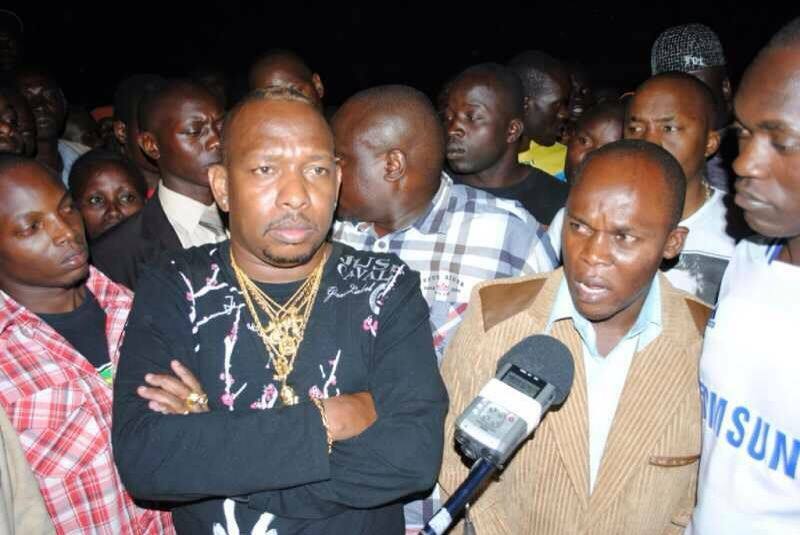 What exactly is the place of Sonko? How will historians describe this once-in-a-lifetime political character? He has been accused of some of the meanest things a politician can be accused of; like “capet-banging” another married politician and ‘leaking’ the photos! Photo-shop with Madiba? Yet, all these career threatening allegations (add to the “white powder” thing) pale in comparison to who, and what Sonko really is to Nairobians, especially the poor. On Christmas day he was at Baby Blessings Children Centre (watch video) with the abandoned children and the orphaned. The previous day he had donated foodstuffs to poor neighbourhoods Â Nairobi in other sprawling slums of Nairobi. Earlier he had visited Kangemi where there was a fire outbreak and could not afford to miss the Kibera train crash. That Sonko can visit any part of the lowly, political Nairobi and get out without heckling, uproar or outright violence intrigues. He can be in Kibera just like he can get to Mukurwe kwa Njenga. Some of these places President Uhuru can only visit by imagination, or under very tight security! He came from obscurity and felled one of the city’s political boxers. Before they realized in the 10th parliament, he had sneaked in with the kind of attire which ‘worried’ then Solomonic speaker Kenneth Marende. Soon there will be elections and he chose to dream higher, going for the senatorial seat. IEBC records have it that he got more votes than any contender for any other post in Nairobi. Meaning, he was elected by a bipartisan vote bloc -both Jubilee and Cord. His aides do not hide the fact that Sonko will be a one term senator. He has trained his guns for the Nairobi governorship and it will take his opponents Â I don’t know what to stop him. How do you beat Sonko in politics? In Nairobi politics? This is the nagging question that should disturb handlers of Gov Dr Evans Kidero! Unless, he too is not defending his seat come 2017. Let me paraphrase the preface of Les Miserables thus, “So long as there shall exist, by reason of law and custom, a social condemnation, which, in the face of civilization, artificially creates hells on earth, and complicates a destiny that is divine with human fatality; so long as the three problems of the ageâ€”the degradation of man by poverty, the ruin of women by starvation, and the dwarfing of childhood by physical and spiritual nightâ€”are not solved; so long as, in certain regions, social asphyxia shall be possible; in other words, and from a yet more extended point of view, so long as ignorance and misery remain on earth, politicians like Mike Mbuvi Sonko, the flamboyant senator of Nairobi County, will always win elections!